Wow, it’s been a while since I last blogged - and here comes a tiny helper to upload one or more CSV file to a SharePoint Online list. I think its the best documented script I ever created…!!! The following script checks a folder for files - and opens them. Then each line will be uploaded to the specified SharePoint list defined by the provided mapping. The mapping is kinda straight forward. The header (if present, skip it with -skipFirstRow flag) is not required, you have to provide it via the -mapping parameter. and want those values in a list with Column1 and Column2, then provide the script -mapping Column1, Column2. Please note: The types are currently not passed and I only tested it with text values - if that is something you need, it could be easily added. And the rest of the parameters? They are of course documented in the script. Copy it to a file and do get-help -full to get it! 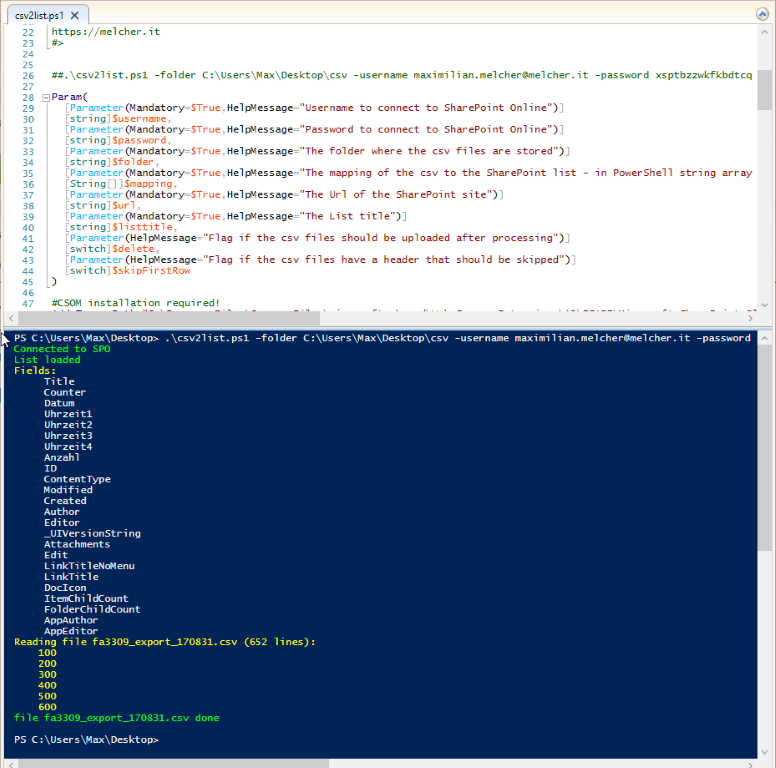 This is a simple Powershell script to upload csv files to a SharePoint Online list - line by line. To connect to SharePoint Online the script requires a username/password the url to the SharePoint site and the list title. To extract the csv files you musst provide the folder location and if the csv contains a header. Lastly the script needs a mapping to map the content of the csv file to the SharePoint list. The csv header is used to map the entries to the SharePoint list. The mapping is provided in PowerShell string array notation, no quotes, separated by comma - in this case the SharePoint list has the fields Counter, Title, Datum, Uhrzeit1, Uhrzeit2, Uhrzeit3, Uhrzeit4 and Anzahl - they appear in that order in the csv. Currently I only tried to upload plain text - if you want more sophisticated field types, that should be easily doable. write-host -ForegroundColor Red "Folder $folder does not exist"
write-host -ForegroundColor Red "No csv files in folder"
Write-Host -ForegroundColor green "Connected to SPO"
Write-Host -ForegroundColor green "List loaded"
Write-Host -ForegroundColor Yellow "Fields: "
Write-Host -ForegroundColor Red "Mapping incorrect - Field $h is not available in the SharePoint list"
$lines = Import-Csv -LiteralPath $file.FullName -Header $mapping -Delimiter ";"
write-host -ForegroundColor Yellow " ($(($lines | Measure-Object).count) lines):"
write-host -ForegroundColor Yellow "skipping first row"
write-host -ForegroundColor Green "file $file done"
So is it working for you? If so, please leave a comment!